We take all of the hard work out of creating a professional ad -- just click a few buttons and you're done! By using our Craigslist real estate website posting tool, you can build links back to your website, increase your viewers, and more! POST PROPERTIES TO CRAIGSLIST FOR FREE! Craigslist has been taking over the marketing from newspapers across the country and is one of the greatest local posting websites in the world! Many Real Estate Brokerages have started turning to Craigslist to find new customers across the full range of services. If you have never considered Craigslist as a way to promote your products or services, it is important to understand some of the advantages it has over other platforms. 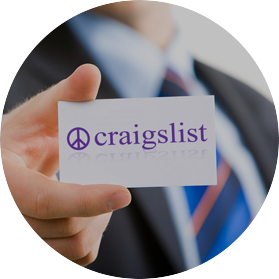 Craigslist is the seventh most-popular website in the United States, with over 60 million people visiting every month. Now with Intagent, you can take any uploaded property that you have and post it to Craigslist in just a few steps. We take all of the hard work out of creating a professional ad, just click a few buttons and you're done! By using our Craigslist real estate website posting tool, you can build links back to your website, increase your viewers, and more! Expanding your market by posting to Craigslist has never been easier! Just click, select and post!